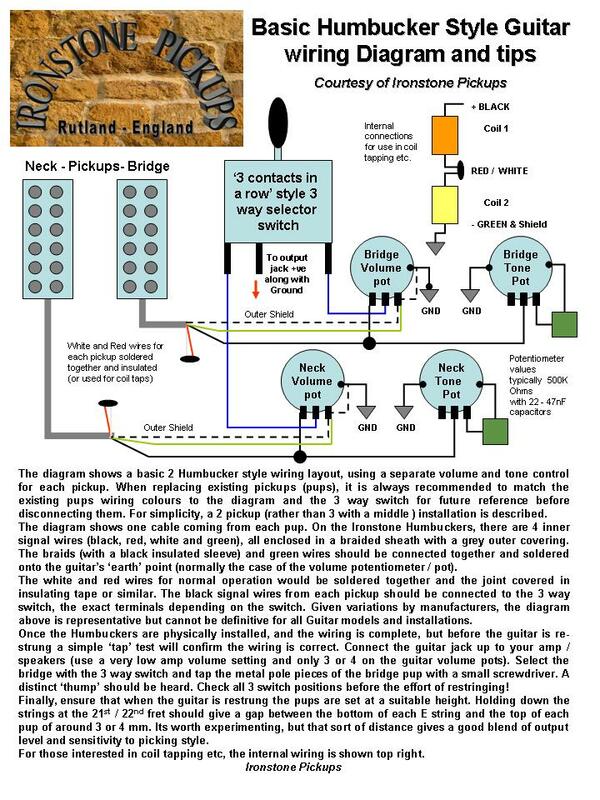 The installation of any set of humbucker pickups is quite straightforward for anyone with some basic soldering skills. There are only 4 or 5 connections to make and its very easy to test the installation prior to re-assembly (and re-stringing) with no more than your normal amplifier and a small screwdriver. The following Humbucker wiring diagram gives a diagrammatic representation of a generic Humbucker configuration. If you have any technical questions, or need further information regarding the Humbucker wiring diagram, please do not hesitate to contact support at Ironstone. If you are a little more adventurous, check out the Ironstone guide to humbucker coil tapping and associated modifications. Note; The previous version of the Ironstone Humbuckers used a grey connecting cable, with colour code as below.